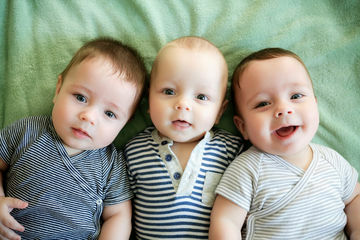 According to a new study, children born to sperm donors are about as healthy as the rest of the population. But is this news actually surprising? A new study confirms something that's well, not that surprising: According to new findings, babies born using donated sperm are similar to the rest of the population in terms of health and well-being. The research, which appears in Reproductive Bio-Medicine Online, involves the study of 224 children aged 5 to 11. Researchers used questionnaires to evaluate the mental and psychosocial well-being, health needs and development of the children involved. According to their findings, the children surveyed appear to be on par with children born "the old-fashioned way," which may reassure would-be parents who plan to conceive using sperm donors. This effect appears to exist across a variety of familial set-ups: The children of heterosexual couples who were born via sperm donors fared similarly to those raised by lesbian couples or single parents. Again, this isn't terribly surprising, but it may give parents who are pursuing this path to parenthood some peace of mind. With sperm donors becoming more and more common, it's comforting to know that, while actually conceiving your children may be more complicated should you go this route, your child will be just fine. "For prospective parents, the decision to use donor sperm can seem like a step into the unknown," Professor David Amor from Murdoch Children's Research Institute said in a release for this study. "Our results should provide reassurance that the physical, psychological and mental health of children conceived using donor sperm is similar to that of children in the general population." Does this news surprise you at all? We wouldn't have questioned whether children born thanks to donated sperm are unlike other children their age, but now science is backing up the idea that when it comes to health and development, sperm donation is nothing to worry about.